The biography of Lalith William (Samarasekera) Athulathmudali consists of a series of chaotic events that resemble burning pyrotechnics. Whenever he visited his most preferred confidante in Switzerland, it had always been a much awaited affair. Even though he had a conciliatory married life after the espousal, it was a matter of living apart. When the first child was born, there was not a servant that could have helped and the second faced an untimely death. It took him 10 years to embark on his political career. His Ministerial statuses were confined to very short periods hence sustaining in those were somewhat a challenge and it was a matter of litigation for mere membership of party. He had to spin others’ string due to so called ‘impeachment’. The bomb which was aimed at J R fell on to his lap. Owing to aspersing of others even on tentative terms, his spouse separated from him. Although he performed round-the-clock for the sake of others, his heart was pierced by a bullet which came out from a pistol of someone of the society which he dedicated his entire life to work for. “It is quite lamentable indeed that his assassination was during the most commendable period of his life,” stated Sirimavo Bandaranaike. Lalith himself stated once: “You should go ahead with your initiatives and you will be justified in aggregation of the past.” Still this remains to be a question! “Search for what is right but not for who is right,” was his motto. Higher education was the main artefact in order to explore the prevailing truth. He designed a strategy foreseeing the succeeding challenges by applying knowledge acquired through education locally and overseas. The chronically established traditional Sri Lankan social background was the main state of difficulty that needed to be resolved during the implementation of his plan. He ascertained that the prospects of the country would be in jeopardy on account of not only the traditional background but the progeny of this same society. Every political tragedy he came across subsequently, after commencing his career in main political stream were occurred as the consequences from insanely irresponsible wildly acts of some morons who stagnated in their conservative point of view. Lalith once in dialogue with Kadirgamar said: “I know what sort of future there will be for us and also I know that it is in my hand that it will lie. Then I asked what could be the delaying fact of you getting into politics,” towards which Lalith’s immediate reply was: “It cannot be done promiscuously thus relevant education is indeed required for this”. Bearing that appreciable intention in mind, Lalith had been continuing his studies in England at Universities of Harvard and Oxford for many years. Yet, it was a much awaited period of 10 years after he returned (while practicing as a lawyer) that finally took him to embark on his political career with the UNP. Michael Morris who was appointed President of the British-Sri Lankan Parliament Group in 1979 stated: “During this period, I often visited Sri Lanka and had the opportunity of associating with the politicians of various capacities. Considerable numbers of experts and intellectuals were accumulating around J R who was a brilliant politician. But what I realized was that Lalith Athulathmudali was the most congenial young politician who was best suited for J R as well as the country”. 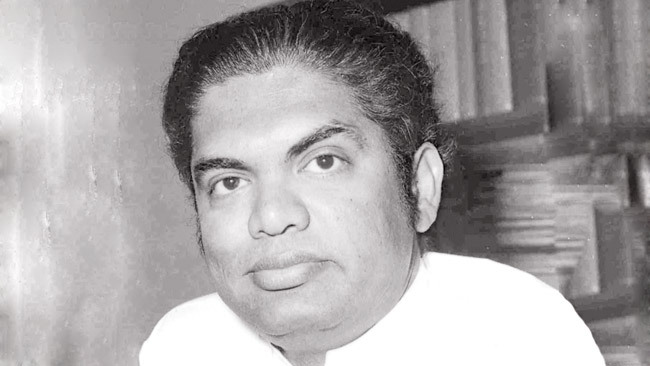 Lalith who entered the judicial complex at ‘Aluthkade’ as an attorney on his arrival from England and subsequently joining the UNP, was competent to obtain the post of Minister of Commerce in 1978 without much effort. J R implemented the Open Economy. By that time, Athulathmudali was quite busy in associating with various international mercantile agreements and workshops as the pertinent minister. Lalith met Srimani De Seram in March 1978 who was attached to UNCTAD in Switzerland, a friend of his brother Dayantha Athulathmudali. Yet, he was only determined to get married in 1981 December. Due to non-availability of a registrar in Geneva their marriage was registered through the Sri Lanka Ambassador in Switzerland. A small evening function was arranged to celebrate the event where Dr. Gamini Corea, the General Secretary of UNCTAD at the time (a relative of Srimani) was of significant presence on the occasion. Although they got married, they led separate lives in two different countries until Srimani Athulathmudali returned to Sri-Lanka in 1982. 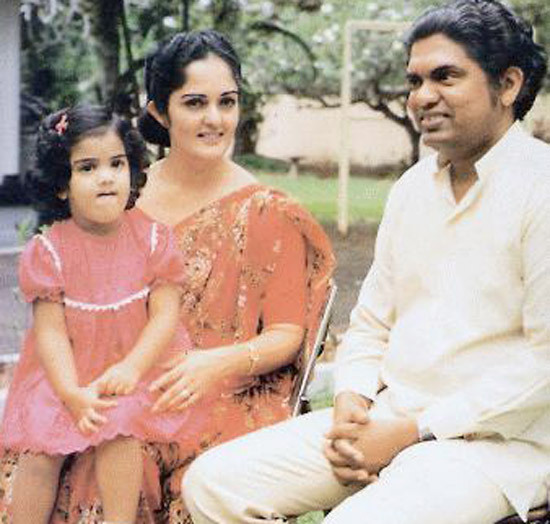 Even after her arrival, it was a busy life that Lalith had to lead due to the Presidential Election in 1982. The arrival of his first baby was the leading factor for him to implement a policy for education and nutrition. The birth of his daughter ‘Sarala’ and the implementation of the concept ‘every student is to be provided with a free glass of milk,’ took place hand in hand. Soon after, a student scholarship scheme namely ‘Mahapola’ was introduced since Lalith emphatically believed that the young generation should be well educated to build a prospective future. Furthermore, they should be financially supported in making their education more sustainable. In 1984, Lalith was appointed Minister of Defence by J. R. due to his proven ability whilst holding responsibilities of various ministries entrusted to him 1978. Lalith believed that Sri Lanka should be a naval transit hub in the South Asian region and brought the country to success by bringing its position to 26 in 1978. Previously, it was 139 out of 570 existing container harbours in the region. It was a dilemma Lalith was facing due to much affected matters of students’ - the critical nutrient issue, financial issues of university scholars also ensuring the security of POWs. He had been recognized by the world as a humanitarian. Yet, so much as the insurgents widely spread across the country thereby linking highly traditional conservative local community groups, it was quite difficult for him to determine a congenial cause of action in accordance with the prevailing situation. He decided to transfer around 2,000 terrorists from northern terrorist groups who had been taken into custody in mid 1987, from Jaffna to Galle to ensure their security. Nevertheless, J R was not satisfied with this decision. Even as the Minister of Defence, he was brave enough to boycott the signing of the Indo-Sri Lankan Accord on 29-07-1987 in public. On meeting Indian Prime Minister Rajiv Gandhi that same evening, he further clarified the reason for his refusal. “The minority of the country is stating many issues to be compromised while others complain of the ever increasing dangers. The government has to resolve all these matters. Placing one’s trouble on someone else’s account, would only be a change in terms of appearance. Yet, the issue remains. These are not personal issues but quite bigger and critical. The future of the country will be entirely determined upon the consequences of how the existing issues are treated. We will be decried by the next generation if we fail to do so and if it succeeds, we will remain in history with no condemnation of whatsoever even if the people do not remember us.” He was capable enough to expand the security forces of the country by 60,000 soldiers in1987, which was 11,000 at the time of taking up his appointment as the Minister of Defence. Although J R and Lalith had constantly been focusing on the traditionally conservative community, the intensity of the change was quite slow. The new president who swore in 1989 revoked the position of Lalith Athulathmudali as the Minister of Defence. Yet, although it was announced by the President that the candidate who obtained the highest number of votes would be the Prime Minister, he did not comply towards this even after Lalith had obtained 235,442 votes. Even though Lalith Athulathmudali had addressed 138 meetings across the country towards the sake of the election candidate during the Presidential Election campaign, soon after the election results, the heads of CWE and Port which was under Lalith’s administration were sent home by the new President. Later, he was appointed afresh as the Minister of Agriculture. Yet one year later, he was appointed as Minister of Education and Higher Education. The fact that being given a rare opportunity of being the chief guest for an award ceremony at London Trinity College in England the same year would have indeed held his spirits high. But the most joyous event would have been his daughter ‘Sarala’ being handed-over the trophy for the best orator of the year, by his own hands. Prior to the ‘one man show’ era in Hambantota, there was a similar period of ‘one man show’ in the UNP in 1991. As the educated society always forecasted, conflicts between the traditional and cognizant communities had been continuing. A great deal of authority was not within cognitive community but regulation by alternate groups. Though race, ancestry, caste, level of education and misconception being used as their sources of factual information by critics who meddled with the issue of social discrepancy, the actual fact was of their excessive desire towards gaining political power in the future. The individuals who had some significant weaknesses within them were becoming truculent by this time. Yet undoubtedly, his fate followed him throughout his life with the usual predestination, from his childhood without a change. 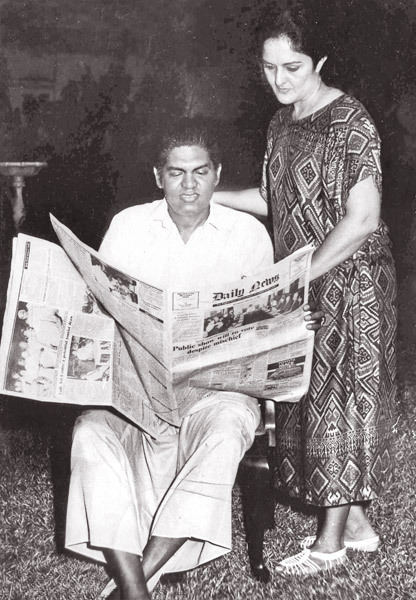 After Richard de Soyza and Laxaman Perera whom he was truly fond of, were obscurely assassinated, appointments of Ministers including Lalith’s were abolished. His party membership was banned and in 1993, police security which had been allocated to him was removed. Steps taken by Lalith at the time would have appeared to be that of rescuing a cart stuck in quagmire. Therefore, not as an individual who was congenitally opulent or intellectual, but as a true follower of J R, the effort which had been taken by Lalith Athulathmudali is firmly taken by the entire ‘Sirikotha’ to protect the reputation of UNP. Just as President Premadasa can be met by anyone at his residence ‘Sucharitha,’ the advocate Lalith William Athulathmudali also gave people the privilege in phoning him even around 0530 to 0600 hrs. By 1993, the personal safety of Lalith was in jeopardy. Public meetings held in Pannala and Nugegoda were attacked by hooligans and while holding a meeting in Dehiwala, an iron bar was thrown at him. Thus at such time, even under the harassments of opportunists, he left his residence at around 4 a.m. in the morning on April 23, 1993. That same evening, Srimani heard the news over the phone of her husband’s assassination. Thus, the country bereaved over losing yet another brilliant character who truly endeavoured in extending his utmost contribution towards uplifting the country and its people from where it laid - a stagnated traditional state to a modern era. This impeccable character is another scholar of Mahapola pursuing his education with the help of a scholarship offered by S.W.R.D Bandaranaike. Srimani Athulathmudali held ministerial responsibilities in the later years and passed away whereas Sarala is currently residing abroad.